Libby's Little Addiction: I *heart* orchids!! Hey Libby, pretty card. I had a copic act like it was out of ink when I was coloring a background like that...I layed it down and when I came back it was all "plumped" up again. Still learning. Pretty card! Glad you are out of your funk :). Great card! Sorry to hear about someone stealing your light box- boo on them! You are still chipper though and that is what is great. Cheers! Darling...great coloring of the orchid! And I love being able to hide out in my office too! I almost feel bad for saying that (almost!). 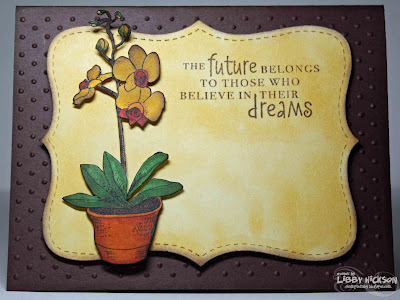 Glad to see you stamping again Libby, this is a beautiful card. Graduates don't need caps, they look silly anyway! Can't wait to see pictures in your fancy schmancy light box. I've always thought this set was so pretty, and the orchid is perfect for you, being an orchid lover and all. I love the way the background turned out with your nearly dry Copic. Nope, grad cards certainly don't have to be all caps and gowns!